Digital Marketing is basically Internet Marketing. But since everything on the Internet is digital, it’s sometimes known as Digital Marketing. 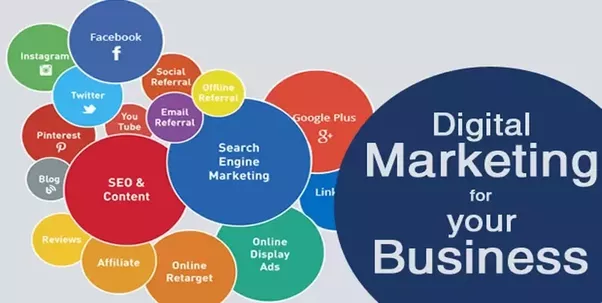 But Digital Marketing itself is made up of several different things from SEO to Optimization, Web Design to Copywriting, Social Media Marketing (SMM) to Digital Advertising to Analytics. Here I’ll give a quick breakdown of each of these different parts that make up Digital Marketing today! SEO is the process, art and science of increasing a websites ranking positions in the Search Engines to make it rank higher up in the SERP results (Search Engine Results Pages). A webmaster, blogger or marketer will have to perform various SEO tasks such as link building as well as content creation (article writing) to SMO (Social Media Optimization) and more. An SEO will usually have to do the work him/herself in order to get those good rankings. Or they can outsource the work to a freelancer from the SEOClerks Marketplace! Talking of SEO, you can’t have the O without the SE! SE and O go hand in hand with each other and while SEO can get you good rankings in the Search Engines. The next stop is to optimize the whole process for the people that are visiting your site to make it as easy as possible for them to navigate around the site and purchase from that site as easily and as quickly as possible. So while SEO can bring in the traffic, the optimization process is to streamline the purchasing experience on your site so that it can convert visitors into actual buyers and clients! Your website is the landing page for your business and it needs to adhere to most of the latest web design trends which mean making sure it’s mobile friendly, making sure it loads fast, making sure it’s easily navigated and making sure there are no broken pages, links etc. As a webmaster or even web designer, you’ll need to learn these latest website design trends, evolve and adapt to them to keep up with the quickly changing landscape. If you want your site to have the latest and best content on things that matter to the people you are targeting, then as a webmaster, blogger or digital affiliate marketer, you’ll need to be able to write copy written articles quickly and also consistently too. And copywriting is basically the art of taking one article and then rewriting it in your own words, in your own way, but with a unique twist to it. You can actually improve on already amazingly written articles by copy writing them which can earn you more respect for that article than the original does for the original authors of it! This is the art of posting consistently on social media sites to always be in they eyes of the people that are using it. The people that are your targeted audience. That’s not always easy and is exactly why we need to do copy writing so you can have an endless supply of amazing, awesome content in which you can actually share to social media in the first place. Different social media sites and platforms all have their own pros and cons but making use of all the top social media sites in this way will help you to stay ahead of your competitors that aren’t! If you can’t see how well your website is doing and for what, how can you know what you need to focus on and or do more of? That where Analytics comes into play. By letting you see what digital marketing campaigns are working and which ones aren’t! So you can know who to sack, fire or drop and who to keep paying and for why. Using Analytics you can get a comprehensive look at how each digital advertising or marketing campaign is doing. It lets you see where your sites visitors are coming from and what they view, for how long and what link they clicked out on. Anyone not using Analytics these days is potentially loosing out on gold mine of valuable information. Advertising can mean many different things since there are so many different types of ads you can take out. Examples would be Google Adsense ads or even Facebook ads, promoted tweets, pins etc. The trick is to earn more back from your advertising than you have spent (ROI). When you have cracked that, you will just want to keep repeating it over and over again so that you’re always earning more back then you’ve spent on the actual ads that you’re taking out. Okay so that’s about 7 different parts that make up digital marketing today. Do you make use of all of these methods and parts when seeking to get good rankings, traffic and authority online today? What other digital marketing methods are there that you make good use of and why?